Ellie was very excited about her first airplane ride -- 8 hours of being admired by a captive audience of 200 other passengers. Fortunately for us parents we had a direct flight from Manchester to Philadelphia, which went smoothly and quickly despite them running out of food (not too bad for our not-so-favorite airline). It seemed that Ellie's first observation about America was that it is really dark. 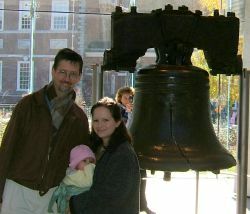 That might have been because our mixed up clocks had us sleepy in the day and wide awake at 3 a.m.
We thought it very appropriate that Ellie got to see the Liberty Bell on her first day in her native land. I enjoyed the 30 minute film on the writing of the Declaration of Independence and Constitution. Crystal was happy to patronize Starbucks, which seemed to be beckoning to us from every street corner. 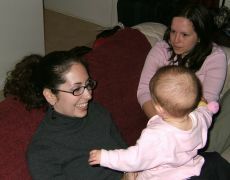 We all enjoyed the kind hospitality of our friends Matthew and Allison. Allison and Crystal became good friends in medical school ("Young" and "Zaidle" were positioned next to each other throughout orientation...I think Allison has gotten over her grudge about me moving Crystal up to the front of the alphabetical order for graduation). Allison, Crystal and Ellie had a chance to hang out while I attended the annual conference of the Society of Biblical Literature. The word was that Ellie was literally mobbed when Allison took Crystal shopping at the mall. It must be tough being so cute. 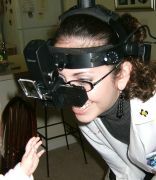 Allison is now doing an opthamology residency at the Wills Eye Hospital in Philadelphia. She modeled her fancy, new eye examination equipment. Ellie was surprisingly unflinching upon faced her first cyborg. After enjoying our cheesesteaks and our friends, it was time to continue our journey to Texas! More later.